Anybody who knows anybody who was a wrestling fan should be devistated right now after hearing the news of the death of Randy “Macho Man” Savage, who passed away today as a result of a car accident brought on by a heart attack. This was a man who worked and worked throughout the 1980s and 1990s and helped to create a solid framework for professional wrestling into the 2000s. He was not the most popular, or, lets face it, he was not allowed to be the most popular, mainly due to Hulk Hogan stealing the spotlight. However, he did what he could to make the midcard strong in the 1980s. He brought attention to the smaller “big man,” and, until his stint in Spider-man (Tobey MacGuire), was the poster child for the wrestling star who wasn’t humongous, but was still muscular, athletic, and breath-taking to watch perform. Watching him fly and glide off of the top rope to hit his signature elbow drop is something that even non-fans could appreciate, as he did so with all of the pomp and circumstance that could be imagined. 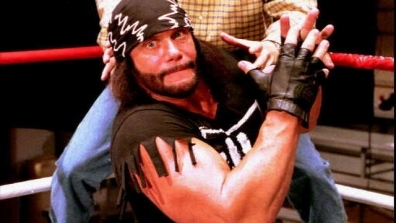 I feature an image from the later part of Macho Man’s career, when he joined the new World order and continued playing second fiddle to Hulk Hogan, but even Hulk, who has had a long-standing real life feud with Savage, couldn’t argue against Savage being part of the elite brotherhood of the nWo, and more broadly professional wrestlers. Rest in peace, Randy Savage. I disliked him for a while, because he had a feud with Ricky “The Dragon” Steamboat (don’t judge). But I loved him after he turned face and started being nice to Miss Elizabeth. This is so sad – and the picture of him and his wife that TMZ featured showed him as a grownup, happy man. That makes it even sadder.